October 11, 2017- Knitting in Recovery was represented at the Ventura County Arts Council‘s (VCAC) Art Stars award ceremony. VCAC’s mission is to advocate for artists and the arts across Ventura County. The bi-annual Arts Stars award ceremony is VCAC’s way of honoring local organizations, government agencies, and business people that are exceptional advocates of the arts. Knitting in Recovery staff were invited to attend the event for their phenomenal work using art as healing in the addiction/recovery, mental-health, homeless, and abuse survivor communities. Artist and poet, Kat, opened the night with her poem “Call me an Artist.” Kat is a poet with Kidling Studios, which serves adult artists with special needs. VCAC has partnered with Kindling Studios on several projects. Probation and Juvenile Hall receiving award for Community Support of the Arts. 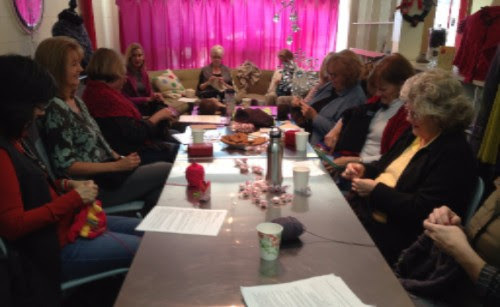 Knitting in Recovery will be starting classes at the Juvenile Hall beginning in December. 2017 Art Stars award recipients with one-of-a-kind awards from glass artist Aya Oki. Many thanks to the Ventura County Arts Council for having us and to Levity Live for use of their venue and great service throughout the event.